Trade in Ruspolia nitidula commonly known as grasshopper and locally known, as Nsenene is becoming a valuable source of income for many poor people in central Uganda, which although modest in terms of monetary value, could nonetheless form a significant proportion of their annual income. Though eaten by a large proportion of the population in the central Uganda, there is much less documented information on its commercialization and income potential. A study was, therefore, conducted to document consumers' perceptions about eating these R. nitidula; marketing chain, market locations, and the people trading in R. nitidula; the average price, income generated and the challenges and opportunities for marketing it in central Uganda. Two divisions (Central and Kawempe) of Kampala City and one sub-county (Nyendo-Ssenyange) of Masaka district with high concentration of R. nitidula business were surveyed. Seventy R. nitidula traders and 70 consumers were interviewed. Data were edited, coded, entered and analyzed using Statistical Packake for Social Sciences (SPSS). Results show that R. nitidula is a delicacy and cultural food eaten by the majority of the people in central Uganda. The average retail price per kilogram of R. nitidula was Uganda shillings 5,000 (≈US $2.80), which compares favourably with that of goat meat, which retails at approximately Uganda shillings 4,000 (≈US $2.13) per kilogram in Kampala districts. The trade was dominated by men and characterized by wholesalers who buy R. nitidula from collectors and sell to retailers. The average price per kilogram of R. nitidula increases from collectors to wholesale traders and to retailers. Collectors charged the lowest price although their profit margins remained the highest. Several barriers, such as high market dues, hamper the trade in R. nitidula. There is a need to streamline the trade in R. nitidula so as to protect traders from high taxation by the market administrators. The possibility of adding value to the R. nitidula should be investigated because it is mainly being sold in fresh form and yet it has a short shelf life. Key words: Marketing, Trade, Ruspolia nitidula, Uganda. Insects are good source of protein, with high fat contents (and thus energy) and many important minerals and vitamins . Malaisse gives a good overview of the nutritional values of various caterpillar species and confirms scientifically what local people knew empirically . The average percentage of proteins and fat as well as the average energy value of 24 investigated fresh caterpillar species was found to be 63.5 ± 9.0 % for proteins and 15.7 ± 6.3 % for fat. This results in an energy value of 457 ± 32 kcal per 100 g (numbers based on dry matter). Compared to meat or fish, caterpillars have higher protein and fat contents and provide more energy per unit. Depending on the species, caterpillars were reported to be rich in different minerals (e.g. K, Ca, Mg, Zn, P, Fe) and/or vitamins (e.g. thiamine/B1, riboflavin/B2, pyridoxine/B6, pantothenic acid, niacin). Research shows that 100 g of cooked insects provide more than 100 % of the daily requirements of the respective contained vitamins/minerals . Malaisse reveals that consumption of 50 g dried caterpillars meets the daily human requirements of riboflavin and pantothenic acid as well as 30 %of the requirement of niacin . There has been increased interest by scientists and governments in some countries in recent years in harvesting insects as food and for sale. In 1983, farmers in Thailand began collecting grasshoppers for sale. Grasshoppers rose in price from US $0.12 per kg in 1983 to US $2.80 per kg in 1992 . A small farmer could earn up to US $120 per half acre -twice as much as he could from corn and the trade in grasshoppers averages about US $6 million per year. During recent grasshopper outbreaks in southern Mexico, an extension specialist from Mexico City demonstrated grasshopper recipes , and freshly-prepared Sphenarium could be purchased in local markets for 4000 pesos, or about US $1.25 per 454 g. The grasshoppers are collected in sweep nets and placed in water for 24 h. After being drained, they are placed in boiling water for 30 min with added salt and garlic. In Africa, the consumption of insects is part of the tradition of many communities, with many species being consumed either as delicacies or as important components of the daily diet . Eating insects is particularly more important in Africa due to necessity than to choice because the climate and small-scale nature of animal husbandry reduces the amount of animal protein and the diet has to be broadened to include insects . In addition, the consumption of insects is not only a coping strategy in times of food crisis but as the explorer-missionary David Livingstone noted, insects, such as termites and grasshoppers, were often regarded as a favoured delicacy by many African tribes . Banjo et al  also reported that some of these insects which are even regarded as pests such as termites also have high nutritional qualities. Owen noted that in Uganda, the insect species used as food are those that are seasonally abundant, and that people who are no longer dependent on wild foods still collect insects . Widely eaten insects in Uganda include termites, crickets and cone-headed grasshoppers (Ruspolia nitidula). The cone-headed grasshoppers (Ruspolia nitidula) occur in immense swarms with the onset of the rains . In Central Uganda, the species is locally known as R. nitidula and the Abdim's stork (Ciconia abdimii) as the R. nitidula-bird because it tends to follow the swarms. Flights of the birds' (Ciconia abdimii) herald arrival of the R. nitidula . These birds (Ciconia abdimii) migrate north from about November to March, passing through east Africa during the heaviest rains, and they end up in north Africa in April or May when the rains come there. The arrival of the storks with the rains has led to native folklore giving it the title of rain-bringer, in an area where the people depend on the rains for the success of their crops. Superstition demands that the bird be free from any type of disturbance. There is little information on the commercialization and income potential of R. nitidula. 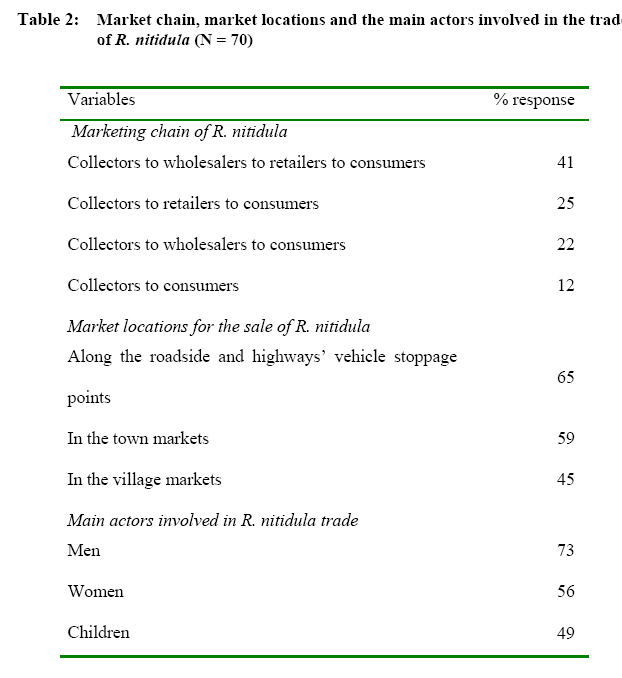 There is also a dearth of information about consumers' perceptions and actors involved in the R. nitidula trade. 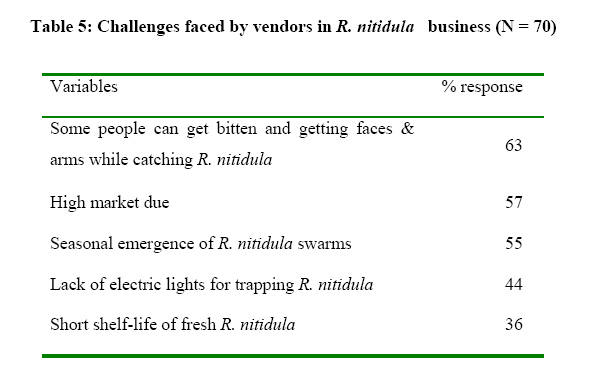 This study assessed consumers' perceptions about eating R. nitidula; marketing chain, market locations and the main actors involve in the trade; the average price and income generated from the trade in the local markets; and the challenges and opportunities for involved marketing R. nitidula in central Uganda. The potential for generating revenue for local and central government and incomes for the poor people justifies this study. The study was conducted in Kampala and Masaka districts in central Uganda. Kampala lies between latitude 0°19´ N and longitude 32°35´ E . The district has a bi-modal rainfall regime with peaks being March to May and September to November. The mean annual rainfall ranges between 1,750 mm to 2,000 mm. The temperature is moderately high with a minimum of about 17°C and a maximum of about 28°C. Traditionally, the local economy has been centred on trade. Masaka district on the other hand is located between 30°3´ - 31°3´E and 0°15´ - 0°30´S . The area has a bi-modal rainfall pattern with distinct wet and dry seasons. The temperature ranges from a minimum of about 18°C to a maximum of about 30°C. About 80% of the total population in the district derives its livelihood from farming. Two divisions (Central and Kawempe) of Kampala City and one sub-county (Nyendo-Ssenyange) of Masaka district with high concentration of R. nitidula business were surveyed. Seventy R. nitidula traders and 70 consumers were interviewed using semi-structured questionnaires. Information was collected on consumer perceptions about R. nitidula, marketing chain, market locations, the main actors involved in the trade, price and income generated from R. nitidula trade, challenges and opportunities in the business. Data were edited, coded, entered into Statistical Package for Social Sciences (SPSS) and simple percentages were computed. The marketing margins for collectors, wholesale traders and retailers were computed using the formulae: Collectors' Margin (CM) = (CP/RP) x 100%; Retailers' Margin (RM) = (RP-WP/RP) x 100%; Wholesale traders' Margin (WM) = (WP-CP/RP) x 100%, where CP is the Collectors' Price; RP is the Retailers' Price and WP is the Wholesale traders' Price [13, 14]. When asked about why they enjoy eating R. nitidula, more than half of the respondents said that the grasshoppers were tasty and delicious. About 48% said they enjoyed eating the R. nitidula because it is nutritious and rich in vitamins, fats and proteins. They were not able to name the types of vitamins. 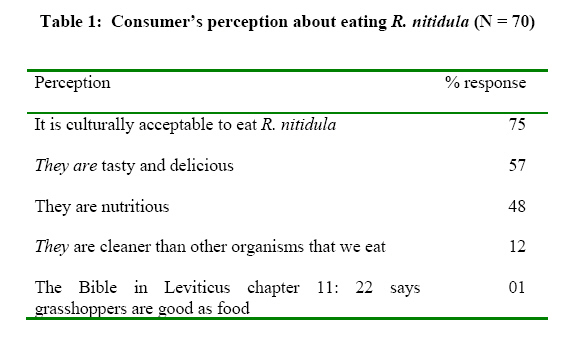 The majority (75%) claimed that eating R. nitidula was part of their culture (Table 1). 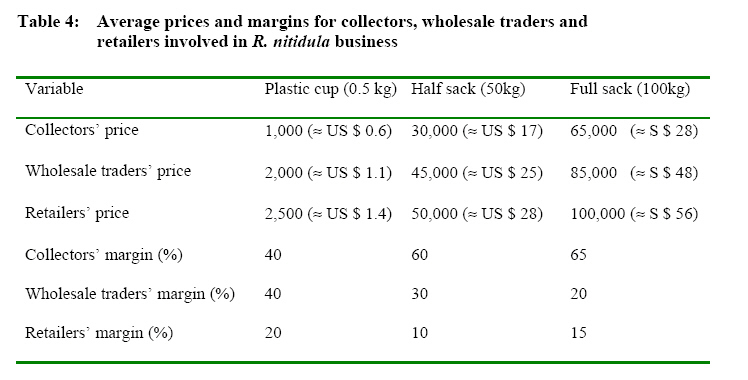 The market for R. nitidula was dominated mainly by wholesalers who buy it from collectors and sell to retailers who in turn sell to consumers (Table 2). About 25% of the market vendors interviewed stated that they bought R. nitidula from the collectors and sold to consumers without passing through wholesale traders. Other identified market chains are presented in Figure 1. The majority (65%) of the traders said that the trade in R. nitidula was concentrated along the roadside and/or highways' vehicle stoppage points. Men were dominant actors in the R. nitidula business. Most vendors sold R. nitidula either fresh or fried (Table 3). 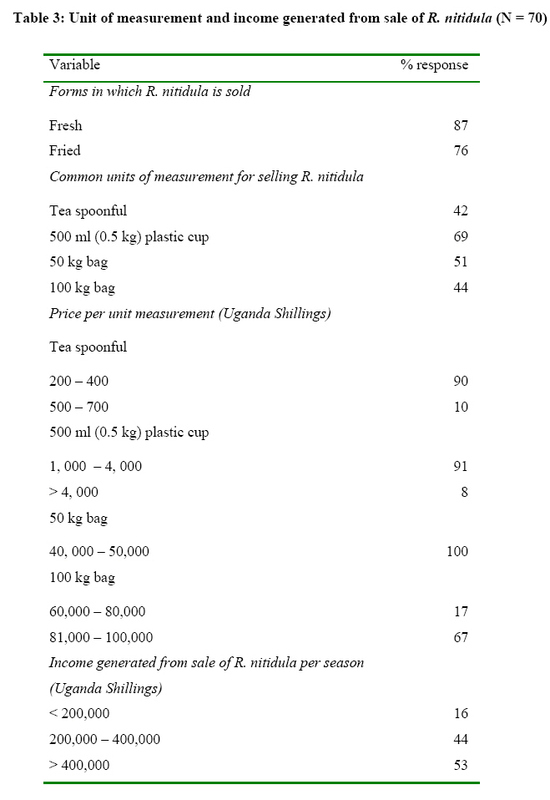 The commonest unit of measurement was half a kilogram or 500 ml plastic cup, which on average cost Uganda shillings 2,500 (≈US $ 1.4) per cup of fresh R. nitidula. One teaspoonful of fried R. nitidula cost Uganda shilling 300 (≈ US $ 0.17). The 50 kg bag cost well over Uganda shillings 50,000 (≈ US $ 28) while 100 kg bag cost about Uganda shillings 100,000 (US $ 55.9). The average price increased from collectors to wholesale traders and to retailers (Table 4). Collectors although charged the lowest price, their profit margins remained the higher than that of wholesalers and retailers. The majority (53%) of the traders claimed that on average they generated over Uganda shillings 400,000 (≈US $ 223.5) per season from sale of R. nitidula. Many of the traders said the money generated helped them to pay school fees for their children and dependants and to buy basic household items. A number of problems including seasonal occurrence of R. nitidula swarms, high market dues, high rate of perishability of fresh R. nitidula and high cost of electric installation to premises constructed for trapping R. nitidula, hindered attainment of a robust business. When asked about the opportunities they gain from the business, majority (36%) said they get employment, income and improved standards of living among others (Table 5). Ruspolia nitidula locally known as Nsenene is a delicacy in central Uganda and may be boiled or eaten raw, or sun-dried, fried and flavoured with onions, or used to make a soup. Most tribesmen in central Uganda are usually eager to share meals with uninvited visitors, but they become more protective when the food involves grasshoppers. Many consumers interviewed said that the R. nitidula is tasty and nutritive. Elsewhere, R. nitidula is a delicacy of the Bahaya tribe of Tanzania . The culture of eating these insects and others like white ants among the tribes in Uganda appears to have begun centuries ago. A grasshopper is a totem to only one of the 52 clans of Buganda kingdom and is not eaten by clan members . Women are not supposed to eat grasshoppers in Buganda but this has changed with R. nitidula. It is believed that if women eat grasshoppers, the children they bear would have deformed heads like those of grasshoppers . The explanation of this tradition is linked to the selfishness of the men who created this fear in the women to stop them from eating R. nitidula. In the past, the collection of R. nitidula was an activity for women and children, despite the fact that women never ate them. It was a tradition that women collect the R. nitidula for their husbands and in return the women would get new gomasi (traditional dress for women in Buganda) during this season. The more R. nitidula a woman collected the better or more beautiful the gomasi she got from her husband. This practice kept women on their toes during the R. nitidula season in anticipation for the reward. This too meant that in a good year, the women would get two new gomasi, given that there are two R. nitidula seasons (May and November) in a year. Children helped their mothers in collecting the R. nitidula during the season. There was also no trade/sale of R. nitidula; every woman and her children strived to collect enough for their husband. However, the R. nitidula were exchanged in a reciprocity manner between male kins which enhanced and strengthened social tie and networks. Today, the sale/trade in R. nitidula has become lucrative and women are now involved both in its collection as well as the trade/sale. There is little doubt that the commercialization of the grasshopper provides a valuable source of income for many poor people in central Uganda, which although modest in terms of monetary value, can nonetheless form a significant proportion of their annual income. Wholesalers who buy the grasshoppers from collectors and sell to retailers who in turn sell to consumers dominate the market chain. R. nitidula are often sold in towns, along the roads or sold within village markets to other traders or consumers. They are sold either in fresh or fried forms. From the survey, it would appear that the average retail price paid for R. nitidula is US $2.80 per kilogram, which compares favourably with that of beef, which retails at approximately US $2 per kg in Kampala. A sack of R. nitidula retails between Uganda shillings 50,000 (US $28) and 100,000 (US $56) depending on the size of the bag. Gilbert Tumusime, a grasshopper dealer at Nakasero Market in Kampala, had this to say… "It's a serious business that is moving on smoothly with many buyers. We pick the sacks from the wholesale traders at Nakawa Market. There is competition but one needs good bargaining skills'. In Masaka, ten years back, the district was famous for its rich, robust and rewarding coffee. But when the price of coffee beans plummeted, farmers started looking for a new way of earning a living. What they found was an untapped market for both fresh and fried grasshoppers (R. nitidula). Similarly in Congo (Brazzaville), it was reported that grasshoppers and other Orthoptera are also sold in the markets, allowing people from rural areas to use these insects as a "cash crop" . Although the average price charged by the collectors is far much less than that charged by wholesale traders and retailers, their profit margin remains the highest. The commercial collectors often invest only once in buying iron sheets and drums that are used for catching and keeping harvested grasshoppers. These materials are kept and used season after season. Wholesale traders and retailers charged high prices perhaps to enable them meet the transport costs and market dues. Higher prices charged by these traders were also a result of high demand for the grasshoppers by consumers. The higher sale price charged by retailers than that of wholesale traders and collectors reflects imperfection in the market . Retail prices, however, can be brought down by an entry of large number of retailers in the business resulting in an increase in wholesale traders' prices. The effect of this would be a rise in collectors' profit and consumers' satisfaction. Women and children are also increasingly getting involved in catching and selling grasshoppers as a way to make money. 'I sell R. nitidula, they have helped me buy clothes, shoes, and pay for my school fees', said Bogere Alex. But the business does have a downside. Grasshoppers are not always keen to be handled and can give a nasty nip. According to one child vendor, 'Many people are bitten when they remove the grasshoppers from the drums, and get swollen faces and arms,'. 'Some people even get sick. But everybody is looking for money, and there is a lot of money in selling grasshoppers.' The vendors also complain of very high market dues often charged to them. Officials at some of the markets in Kampala said that during the April-June and November-December seasons when grasshoppers fall to the ground, over 70 percent of the revenue collected is accrued from grasshopper sales. Many insects are always attracted to light, and these R. nitidula are no exception. The Ugandan electrical company normally charges 'professional' R. nitidula collectors about 300,000 shillings (~US $170) for the month of constant nighttime electricity. Seasonal availability and short shelf life also hinders R. nitidula business. Based on the above analysis, the R. nitidula have considerable potential for generating income and can be used, in some instances, as a vehicle for economic empowerment of local communities in central Uganda. The average price paid for R. nitidula was US $2.80 per kilogram, which compares favourably with that of beef, which retails at approximately US $2 per kg in Kampala. The insect is considered a delicacy in central Uganda. Its trade is dominated by men and characterized by wholesalers who buy grasshoppers from collectors and in turn sell to retailers who later sell to consumers. The business is concentrated around urban areas, along the roadside and or highways' vehicle stoppage points where there are networks of distributors, sellers and buyers. Several key barriers, however, hamper the practical trade of R. nitidula. Among others, high market dues levied to R. nitidula traders have to be emphasized. Based on the findings and insights of the study, efforts should be made by the local government to streamline the trade in R. nitidula so that traders are not exploited by the high market dues. In addition, the potential of adding value to this delicacy should be investigated. Currently R. nitidula is mainly being sold in fresh form. This has a significant negative effect on its trade due to its rather short shelf life of only about two days. The existing community or in-home based value addition activities should be identified through a survey and their procedures documented. This could serve as a starting point for improvement of the existing processes. Gaps in value-addition activities should be identified and used as criteria for determining the new valueadded products for the market. Analysis of the nutritional contents of the R. nitidula using standard procedures should be conducted. Determinations should be performed for proteins, essential amino acids profiles, vitamins, water content, dietary fiber (structural carbohydrates), fat, ash and dry matter content, calorie (energy content) and minerals such as N, Ca, P, Mg and Fe. De Foliart G Insects as human food. Crop Protection . 1992, 11 (5): 395-399. Malaisse F Se nourrir en forêt claire africaine. Approche écologique et nutritionnelle. Les Presses Agronomiques de Gembloux. Gembloux, Belgique, 1997. Anon. Sky prawns and other dishes: the food of the future. Expat World 1992, 4(1):1. (Indonesia: Isoptera). Long K Locust and grasshopper populations plague Mexico. Inside APHIS 1993, 13: 10-11. DeFoliart GR Insects as food: why the western attitude is important. Annual Review of Entomology 1999, 44: 21-50. Bodenheimer FS Insects as Human Food. The Hague: W. Junk, 1951, 352 pp. Livingstone D Missionary Travels and Researches in South Africa. New York: Harper & Brothers, 1858, 389pp. Owen DF Man's Environmental Predicament. An introduction to human ecology in tropical Africa. London: Oxford Univ. Press, 1973, 91pp. Kampala District State of Environment Report KDSOER National Environmental Management Authority, Kampala Uganda, 1997. Masaka District State of Environment Report MDSOER National Environmental Management Authority, Kampala Uganda, 1997. Jagwe G Economics of pineapple in the Lake Victoria Basin of Uganda. M.Sc. Thesis. Department of Agricultural Economic, Faculty of Agriculture, MUK, 1999. Shrivastava RS and M Ranadhir Efficiency of fish marketting Bhubaneshwar of orissa. Bangladesh J. Agric. Econ., 1995, 18: 89-97. Mors PO Grasshoppers as food in Buhaya. Anthropol. Quart., 1958, 31: 56-58. Wasswa H Grasshoppers provoke feeding frenzy in Uganda. www.iol.co.za/index.php? May 26 2006 at 05:24 AM, 2006. Musisi NB 'Women "elite polygyny" and Buganda state formation'. Signs: Journal of Women in Culture and Society, 1991, Vol 16 (4): 757-786. Bani G Some aspects of entomophagy in the Congo. 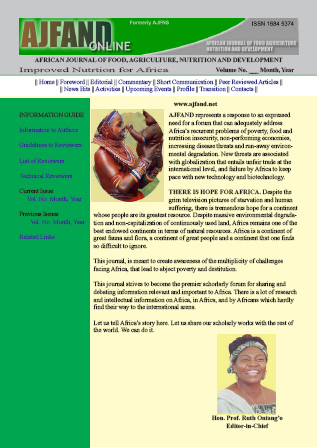 Food Insects Newslet. 1995, Vol. 8(3): 4-5.